Few problems around the home are as frustrating as a clogged toilet; most homeowners know all-too-well how quickly this problem can ruin their day. Clogs seem to occur at the worst possible time, whether you’re expecting company or are headed out the door for an important appointment. Fortunately, this problem is generally simple to resolve without a plumber. A bit of DIY plumbing work can save a considerable amount of money and time in the event of a clog. Don’t worry; DIY plumbing is easy enough for anyone to conquer as long as they keep a few key things in mind. If you are facing a clog, do not panic. Instead, put your best plumbing foot forward and use the information below to help you get your toilet back. Do not continue to use the toilet if it is clogged. If you flush the toilet after it is clogged, you’re far more likely to flood the bathroom and cause many other problems that are both unsanitary and undesirable to deal with. Wait at least 10 minutes after the first flush before you attempt a second flush. If the clog still doesn’t dissolve, it is time to take action before it worsens. Try these easy DIY clog removal techniques before you call a plumber, as many people find they can resolve the problem without needing to call a plumber for help. Always use latex gloves when dealing with plumbing issues. It is bad enough that you cannot block the smell. You certainly do not want to touch any disgusting messes with your hands. Investing in these tools is a small price to pay for the certainty that you can take care of clogs quickly on your own. First and foremost, do not make a special trip to the home improvement store to grab a drain cleaner. Although you see them advertised on television and in magazines, using a drain cleaner may cause more harm than good. No plumber recommends using a drain cleaner to remove a clog. Chemical-based drain cleaners work to remove many types of stubborn clogs, but ultimately wreak havoc on your plumbing system, causing hundreds to thousands of dollars worth of damage in the process. Furthermore, Consumer Reports revealed that drain cleaners are less effective than more traditional methods like the old-fashioned plunger and the techniques outlined below. So, using a drain cleaner may not even unclog the toilet at all and yet still cost you considerably. 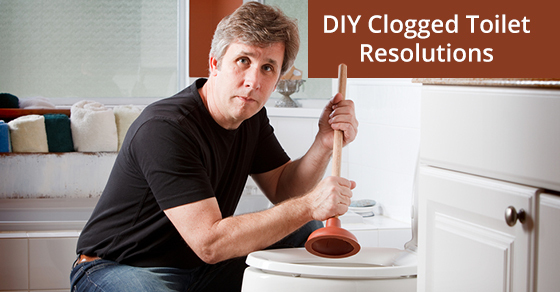 Most people try to remove the clog with the plunger first because it is the easiest technique. Make sure that you use a toilet plunger and seal it firmly around the hole. A few firm pushes down on the plunger should loosen the object causing the clog so your toilet is again usable. The plumber’s auger is another useful tool that removes clogs from the toilet. If you own one of these tools, you are in luck, as it can eliminate even severe clogs in a matter of minutes. Many homeowners use hand augers which are far less dangerous and much easier to use than the traditional auger tool. If you do not own a plumber’s auger tool, a wire coat hanger may remove the clog if it is not buried too deeply within the drain. Liquid dish soap is a tried and true toilet clog remover. Many people prefer the ‘Dawn’ brand dish soap, citing that it works better than others since it contains a grease dissolver. Simply squirt a small amount of the dish soap into the toilet. Let the dish soap sit in the toilet for about five minutes and then pour hot water over the clog. This clog removal method works wonderfully for many minor clogs. Baking soda and white vinegar is another clog removal technique that has helped many people avoid placing a call to a plumber. Simply pour one cup of baking soda into the toilet that is clogged. Let the baking soda sit for a minute or two and pour in one cup of white vinegar. Let the concoction sit for 5 – 10 minutes and pour in hot water to flush. The clog should be gone! These are some of the most common clog removal techniques used by homeowners today. Most of these techniques work wonderfully but again, the results will vary from one clog to the next. It certainly doesn’t hurt to try these methods out before you take the plunge and call the plumber. To book an inspection, call Brother’s Plumbing on (416) 656-6717 or contact us here.